It’s the day before Thanksgiving, and one thing I am definitely thankful for is Mythic Legions! I’m trying to be as diverse as possible on my first pass through the Advent of Decay reviews. So having looked at a human knight, an elf, a vampire, and a goblin, I’ll be checking out a demon today. Behold, the mighty Xarria! 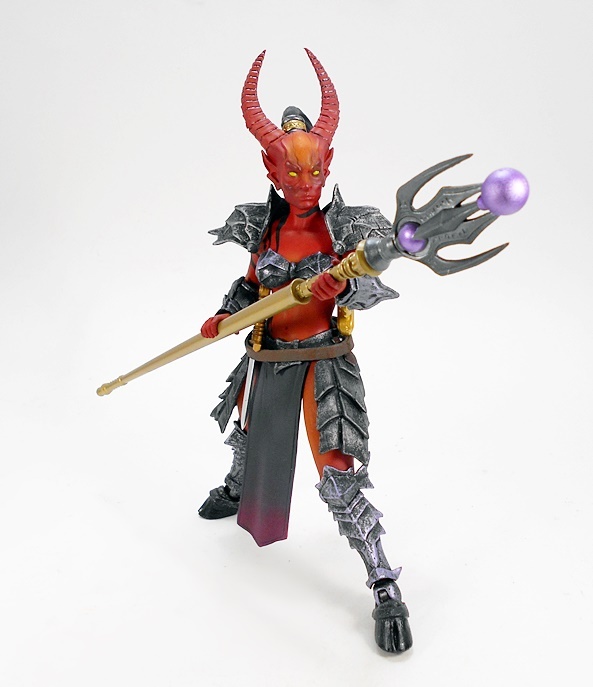 Xarria is not the first demon in the Mythic Legions lineup, but she is my first demon and she’s the first female demon. I passed on the previous demons, because I wasn’t all that keen on their colors, but I found Xarria to be irresistible at first sight. According to her bio card on the package insert, she’s a top general in the Circle of Poxxus, and while I don’t know what that means, it sounds very impressive. She’s also an accomplished spell-slinger and a lady that I would not want to mess with. Let’s get her open and see how she looks! Pretty god-damned fantastic, I’d say! 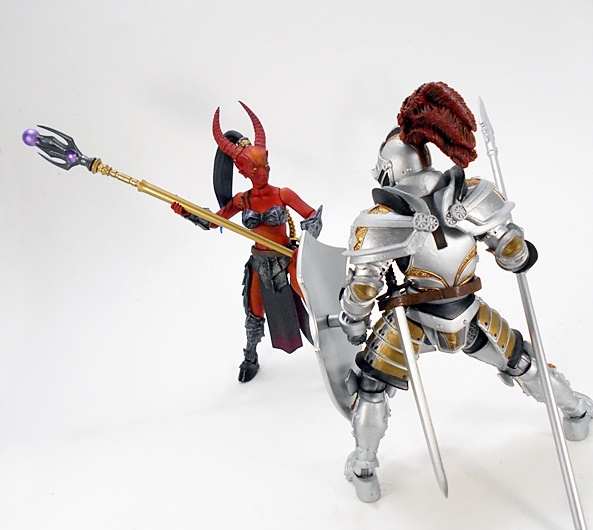 I tend to spend time talking about parts recycling in my Mythic Legions reviews, but that won’t be the case today. The bulk of this figure is made of parts that I’m experiencing for the first time right now, but we’ll be seeing them again many times over before I’m through with Advent of Decay. And as we’ve already seen, females figures are one of the major additions in Advent of Decay and Demon or no, Xarria is definitely a lady! The buck features bare upper legs, nearly bare arms, bare midriff, and a chest protected by her crude armored brassiere. Not to be confused with her brazier, because I’m sure she’s got one of those too. She also has a pair of rough, jagged shoulder armor pieces, which peg into her back and are, as always, optional. The rest of her armor consist of wrist bracers, lower legs, and a belt with hip armor. It’s all the same crude and worn style, basically a slightly more diminutive version of the Orc armor we’ve seen several times in the past, with a pitted iron finish that looks amazing. The leg armor terminates at her demonic hooves, and she has a sash that hangs down from the center of her belt to conceal her demon lady parts. 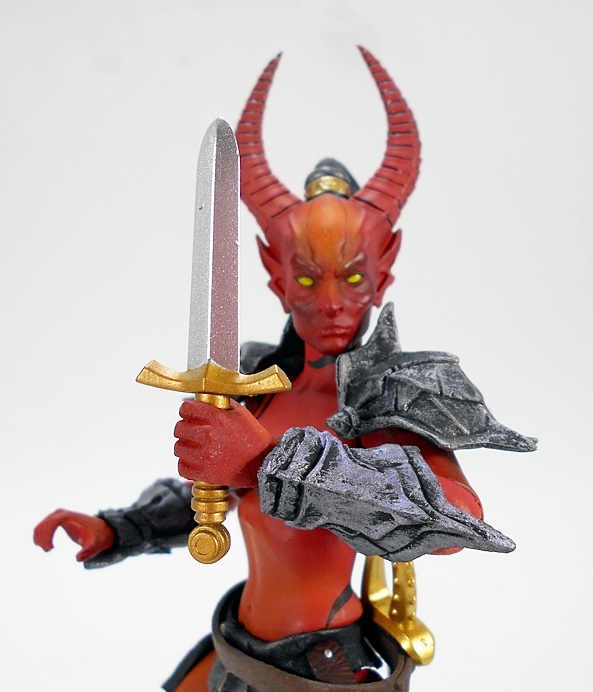 In addition to the excellent paintwork on the armor, I really dig the shade of red used for Xarria’s skin. It features some gradations of skin color from deep read to an a fiery orange. She also has some black striping (possibly tattoos?) displayed on her back and the left side of her body. 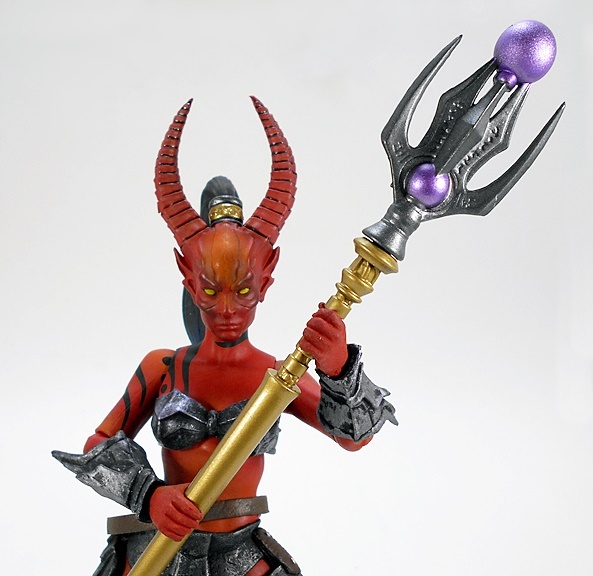 So, first off, Xarria comes with this imposing staff to channel her magic prowess. The shaft is gold and the head is cast in gray plastic and has a purple orb embedded in the middle and another one at the tip. It’s a cool looking piece, and since the top comes off, there’s some opportunity for customization there. This is the first time I’ve seen this accessory, and I’m pretty sure it was introduced in Advent of Decay, but either way I know we’ll be seeing it again. My only real gripe with this staff is that it’s pretty thick where she’s most likely to grip it and that can stretch out her grip, making her other weapons fit loose in that hand. Still, I’ve found that squeezing the hand shut for a bit will help. But sometimes your mana is low and fools still need killing, and so Xarria also comes with two weapons: A dagger, and a what I guess might be termed a falchion. And, yes she also has the usual belt so she can carry her blades either on her waist or across her back. And here’s where this figure starts to lose me a bit. The dagger is the typical cruciform-hilted weapon that we’ve seen matched with swords and packed in with many of the knights. The blade is painted silver and the grip is painted gold. I really like this dagger, but it doesn’t feel like it really fits the character all that well. 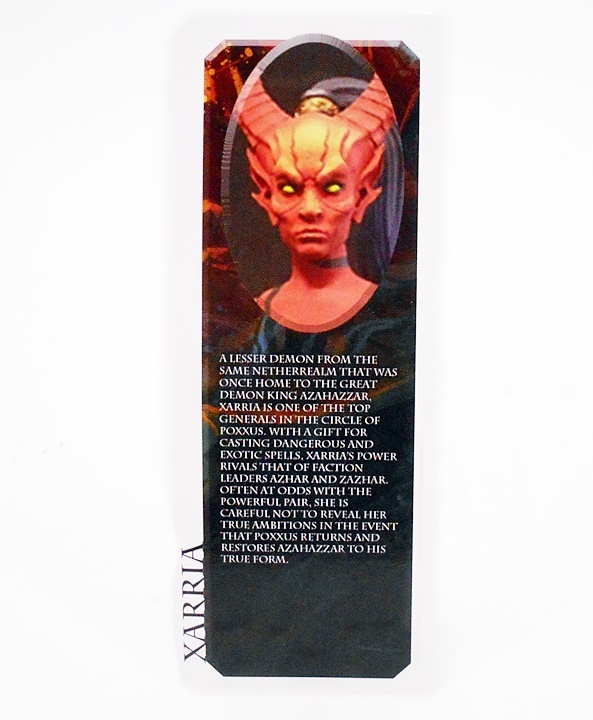 I happen to think that a demoness like Xarria should be packing a more exotic blade. And that goes double for the falchion. This is the first time I’m seeing this particular sword in the line and I really dig the design. It’s got a dramatic curve, a swell to the blade and a nasty-looking clip to the point. The hilt is interesting as the grip curves opposite the blade instead of continuing it. The knuckle-guard is short and doesn’t connect with the pommel, and the weapon is painted to match the dagger with a silver blade and gold hilt, and I should mention that the blade on mine has a bit of gold paint spilled on it, which is one of the first QC issues I’ve had on any of these figures. But like the dagger, this sword just doesn’t really work with the character for me. Now, I kind of get it. The demons are something of an anomaly in this line, as there have only been three so far. 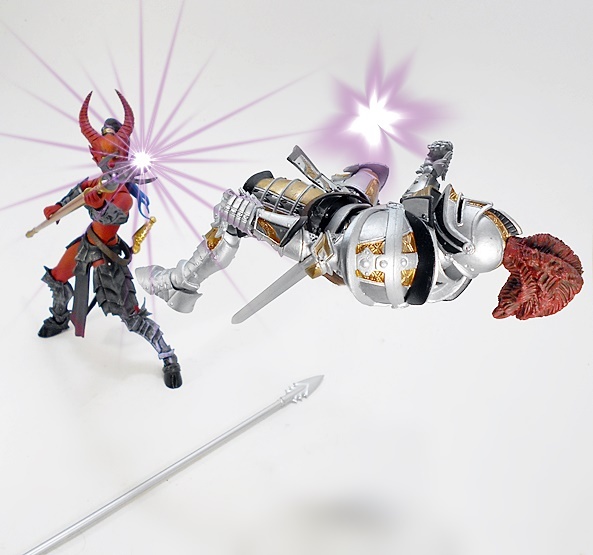 And given Mythic Legions’ strategy of re-using accessories, it makes sense that T4H didn’t want to design a bunch of weapons that would only be intended for a few figures. But I’d still argue that there were better choices than these. It feels like someone just reached into a bin of weapons and randomly drew a couple out for poor Xarria. Holy hell, for possibly the first time ever, I’m actually finishing up a Mythic Legions review without claiming that it’s my new favorite figure! Now, that’s not to say Xarria is in any way a bad one. I dig her a lot. She’s got a cool design, I love the paintwork on her armor, and what’s not to love about adding a demon to my Legions shelves? No, my big sticking point with this figure is just the weapon selection. They feel like the result of a random grab bag, rather than any kind of thoughtful choice, and unfortunately that drags down my feelings for the figure as a whole. 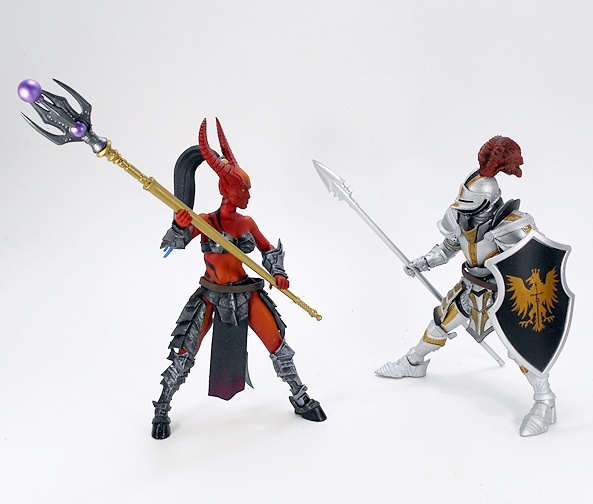 Or maybe it was shrewd thinking on the part of T4H, because now I’m seriously thinking about picking up the Dark Forces Weapons Pack to get Xarria properly equipped with some proper demon weapons.